While Woody went on epic adventures with Buzz and friends and said goodbye to his buddy Andy, Bo Peep has been out on her own and is asserting herself as her own toy. In the past, it was believed that Bo Peep got separated from the others because of a yard sale by Andy’s parents. But that might not be true, as both the trailer and the new poster for “TS4” show how she’s traded in her dress for a sleek outfit and turned her shepherd’s cane into a bo (peep) staff. Along with this reunion, “Toy Story 4” will see Woody and the gang get an unexpected addition to the group: Forky, a makeshift toy made from plastic cutlery and wire cleaners by the toys’ new playmate, Bonnie. When he comes to life, Forky plunges directly into a manic existential crisis, and it’s up to Woody to show him he has value as a toy. “Toy Story 4” hits theaters June 21. Watch the trailer in the clip above. From CAA screenings to a "This Is Us" soiree and a potential Super Bowl halftime preview, here are top pics from inside and backstage the industry bashes of the week with The Party Report's Mikey Glazer. This was the marquee at the Palladium on Sunset Blvd. in Hollywood. Where else do we see this kind of billing? 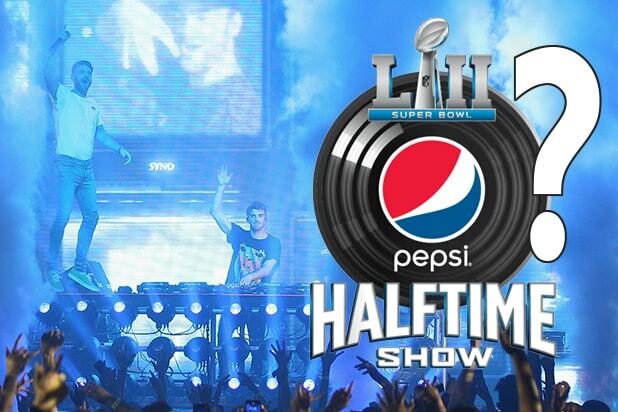 ... At the Super Bowl Halftime show, sponsored for the last several years by Pepsi. Could the guys behind "Closer," "Paris," "Something Just Like This," and "Roses" be headed that way? Before you say "no way, not big enough," here are the stats: Drew Taggert and Alex Pall are currently #28 in the world for streaming consumption and activity on Spotify, the leading music service. Compare that with recent halftime "superstars:" Justin Timberlake (#46, and a huge album flop with no hits), Lady Gaga (#140, no recent hits), Bruno Mars (#40), and Beyonce (#39). Data doesn't lie. This event earned its own mural (left) and was billed as a concert with "Special Guests." The NFL has done a halftime-by-committee a few times in recent years. If they do it again, these could be the guys to anchor it from the DJ booth. Elsewhere this week, Jamie Foxx, Adam Selkowitz, host Michael B. Jordan and emcee Terrence J helped Lupus LA raise $250,000 at Dave & Buster's in Hollywood on Saturday. The night before, YouTube Premium feted its new subscription-tier comedy series "Sideswiped" at its Playa Vista HQ. Two leads from "This Is Us" (Mandy Moore on the left and Chrissy Metz on the right) came to support series creator/star Carly Craig (second from left), Chelsea Frei and co-star Rosanna Arquette. Two generations of action directors came together at CAA on Thursday night. Michael Mann ("Heat," "Miami Vice") congratulates "The Equalizer 2" director Antoine Fuqua at a screening of the Denzel Washington sequel that came out earlier this month. The screening at CAA's Century City HQ was also a showcase for SoundFi, a 3D audio format that has moviegoers wearing special headphones in the theater. Here, SoundFi's Chris Anastas explains. China Chow, Nev Schulman, and Laura Perlongo don't care about messing up their hair. Headphones on! Lyor Cohen, YouTube's Global Head of Music, spoke on stage at Rolling Stone's celebration of its redesigned magazine and website in Brooklyn. (That's Rolling Stone President and COO Gus Wenner on the right.) Shawn Mendes performed for a crowd that included Walmart Yodeling Kid, Mason Ramsey. The whole night was shot for an upcoming season of "Live from the Artist's Den." Over at the Barclays Center in Brooklyn, Mr. New Jersey (Jon Bon Jovi) peeked in on professional e-sports at the Overwatch Grand Finale. That's Brooklyn Net D'Angelo Russell peeking in on Bon Jovi. This was the scene on Friday night: a sold out Barclays Center to catch the "London Spitfire" compete with the "Philadelphia Fusion" for the first ever championship. Video game publisher Blizzard Entertainment owns and operates the Overwatch franchise and the league. Chief Marketing Officer Daniel Cherry III is smiling, and not just because he's with the terrifyingly good actor Michael K. Williams. With the Tomorrowland electronic music festival pulling DJ talent from all over the world to Belgium for two consecutive summer weekends, some refreshing fresh blood got to step in to the headlining spots in Vegas. Brasilian superstar Alok, who has only a cult following here, wrapped a mini two-night U.S. tour by riling up a heated crowd at Encore Beach Club's Nightswim in Vegas. With over 7 million Instagram followers and some global hits, the "Big Jet Plane" producer is on The Party Report's Coachella 2019 prediction list. Turning out a crowd that was over 50 percent Brazilians while going against Afrojack and Marshmello on the same property means he could be on those L.A. billboards soon.